Beautifully engraved Certificate from the famous Isabella Gold Mining Company issued no later than 1901. This historic document was printed by the New York Banknote Company and has an ornate border around it with a vignette of an eagle on a shield. This item is hand signed by the company's president and is over 114 years old. This is a certificate from the Isabella Gold Mining Company from the famous Cripple Creek Mining District of Colorado. The mines owned by Isabella were some of the largest gold producers in Colorado. The company was founded around 1892 by the silver king and railroad tycoon, James J. Hagerman. Hagerman bought the Buena Vista Mine for over $200,000 and other claims on Bull Hill and Bull Cliffwhich started the Cripple Creek boom. The Isabella was also involved in the 1894 labor war. The conflict started when the company announced that it would pay miners $3.00 for a ten hour work day, vs. the eight hour normal salary. 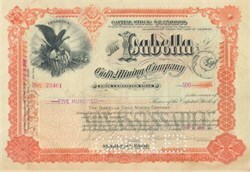 Isabella produced gold up until World War II. The mines were eventually run by the United Gold Mines Company. During its life, the Isabella's mines generated over $15 million in precious metals which made they one of the largest producers in the in Cripple Creek Mining District.